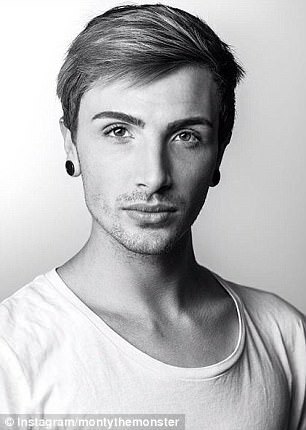 When Monty Thomas was a child and young teen, he was endlessly bullied for his feminine features. From one building of his Queensland high school to another Monty would be verbally abused, as peers and even teachers made fun of his looks. But now those chiseled cheekbones, arched eyebrows, and pouty lips help Monty transform into Jess Whoo, his gorgeous drag persona. And one day he hopes to take her where few drag queens have gone before - the runway. It has been a long and hard journey for Monty, who never felt accepted in his little town of Noosa on the Sunshine Coast. Monty, now 26, was able to find an escape from the cruelty through dance, throwing himself into ballet, jazz, tap, contemporary and musical theatre. Dance, as well as his tight-knit group of friends from church, were his safe zones. 'With dancing, I could just be myself,' he said. In fact, within those four walls of the dance studio, it was quite the opposite. Monty often got to be the star. 'Being the only boy meant I got to be the center of attention,' he said. That place on center stage is no longer unfamiliar to Monty, who has been performing in drag for the last nine years. It was an organic transition as Monty combined his love for both dance and wearable art to performing in his own creations. Monty first dipped his foot into the world of drag long before it became known in mainstream pop culture thanks to RuPaul's Drag Race. When Monty first began, he found that much of the drag world was still based in comedy - a direction he didn't feel really fit him. 'It was very Priscilla Queen of the Desert,' he said, referencing the famous 1994 Australian dramedy starring Guy Pearce. 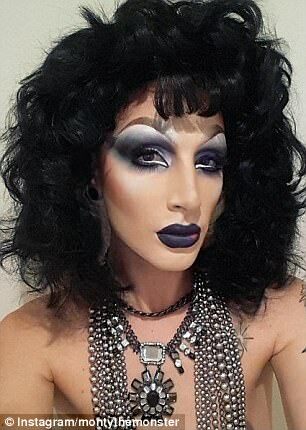 Monty describes his drag style as being on opposite sides of a spectrum, sometimes beautiful and ethereal and other times androgynous and grungy. His 'conceptual' drag is always inspired by a feeling, whether that be empowerment or sadness, that he then turns into a look. One such design was inspired by the death of a close friend, who lost his battle with leukemia. No matter what Jess is wearing, Monty has always tried to show everyone from his family to his small town that there is art behind drag. 'I want to show that when people dress in women's clothes, or something that isn't supposed to be for them by social standards, it doesn't make them weird,' he said. And now Monty is hoping to take his mission to bigger stages, specifically those that come with a runway. 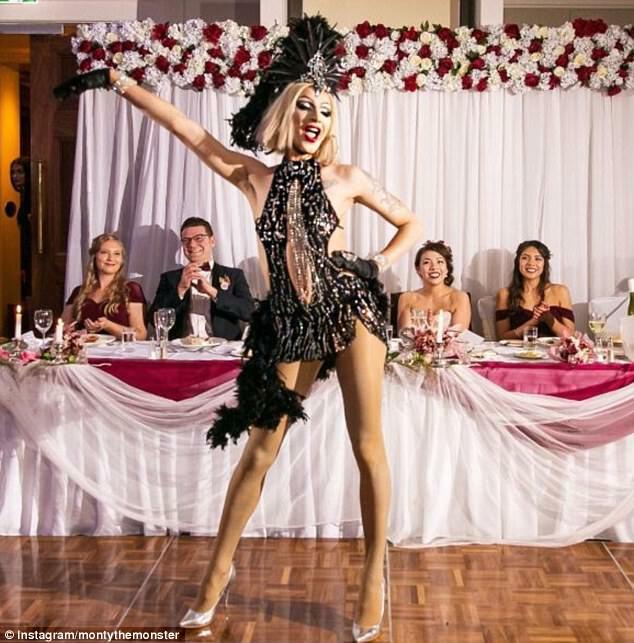 Monty got his first taste of modelling last October, when he became the first drag queen in Queensland to walk in a fashion show. He was asked to come to a casting for the Sunshine Coast Fashion Festival after winning a prestigious style award, and was selected to walk for Myer's menswear. But Monty also emailed the festival organiser pictures of him in drag, and she also decided to cast him in two other shows as Jess Whoo. The experience of walking down the runway as his drag persona was unforgettable. After that show, Monty realised just how influential drag could be in the fashion industry and decided he wanted to become Australia's first ever drag supermodel. He is now working to turn that dream into a reality, spending the last five months building a portfolio that he can show agencies to gain representation. Monty has also living back at home and is working at a high-calibre salon as a hairdresser to save money so he can move to Melbourne within the year. He's hoping to show how powerful a diverse model can be in the fashion industry, and prove they can model anything - and sell products to anyone. Monty hopes that making a name for himself as a model would also prove to people that they can do whatever they want in life, no matter the society norm. 'Women don't have to subdue themselves to a feminine job or lifestyle and men don't have to wear pants if they don't want to - they can wear a skirt!' he said. It's a feeling of acceptance that Monty was denied for most of his life, but that he felt full force on that catwalk. 'Walking on a runway, it was like putting the cherry on top of the sundae,' he said.